Comprehensive review of Shomei Organic Skincare Advanced 2.5% Retinol Serum. See how this retinol cream compares against other wrinkle creams! Shomei Organic Skincare Advanced 2.5% Retinol Serum is a great retinol serum that helps the skin with anti-aging by plumping up the skin. The texture and feeling of this retinol serum are a super thin and liquidy serum. It also kind of has a bit of a slimy texture that feels interesting on the skin when you first apply it. This product is really easy to apply, and since it’s a really thin serum, you don’t need much product at all to cover your entire face and neck. About two pumps will cover your whole face, neck, and chest. After using Shomei Organic Skincare Advanced 2.5% Retinol Serum, my skin felt nice and hydrated, and plumped up. After using this retinol cream for a longer period of time, my skin was very moisturized and plumped up. It also smoothed out my fine lines and helped diminish my hyperpigmentation. My skin was looking and feeling much more smooth and firm. Overall, Shomei Organic Skincare Advanced 2.5% Retinol Serum is a really nice retinol serum that helped plump up my skin and helped smooth my fine lines and wrinkles. The texture and feeling of Shomei Organic Skincare Advanced 2.5% Retinol Serum are a super thin and liquidy serum. It feels kind of slimy when you first pump the product out and it feels kind of slimy on the skin as well. 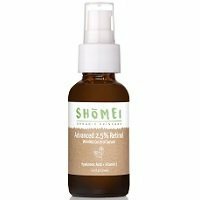 Shomei Organic Skincare Advanced 2.5% Retinol Serum is super easy to apply; it comes in a bottle with a pump, which I really like. Because this product is so thin, you don’t need very much product at all, you only need about two pumps for the whole face, neck, and décolletage. Even though this serum is super thin, it takes a while to dry… about 30 seconds. Something I really like about Shomei Organic Skincare Advanced 2.5% Retinol Serum is there is virtually no scent to this product. I love that there is no added fragrance. After using Shomei Organic Skincare Advanced 2.5% Retinol Serum for a short amount of time, my skin was felling super plumped up and very hydrated. After using Shomei Organic Skincare Advanced 2.5% Retinol Serum for a longer period of time, I started to notice that my skin was looking much more even and my hyperpigmentation was lightening, my fine lines were looking much more smooth, and my skin was plumped up. My deeper lines and wrinkles were more plumped but not totally gone, but overall my skin looked much smoother. Shomei Organic Skincare Advanced 2.5% Retinol Serum is a paraben free, cruelty free, and vegan retinol cream that is full of a ton of interesting ingredients to help with anti-aging. First, aloe vera is a great ingredient for helping skin with anti-aging by healing and tightening skin, as well as helping increase collagen production in the skin. Collagen production is crucial in helping the skin fight the signs of aging. Next, green tea can help with anti-aging because it’s full of antioxidants and can help fight wrinkles by increasing cell turnover. The antioxidants can help plump up the skin filling in the fine lines and wrinkles on your skin. Lastly, jojoba oil is a very moisturizing oil and is great for antiaging because it can help improve the skin’s elasticity with its antioxidant properties. I really like that this is a clean and vegan product and these three ingredients together should really help diminish fine lines and wrinkles on the skin. The cost of Shomei Organic Skincare Advanced 2.5% Retinol Serum is $19.95 for 1 oz of product. This is an average to slightly above average price for a retinol serum. Unfortunately, there is not a money back guarantee for Shomei Organic Skincare Advanced 2.5% Retinol Serum. To buy Shomei Organic Skincare Advanced 2.5% Retinol Serum, click here. Ingredients Aloe vera helps tighten the skin.